Alright, I just bought the TenkarsTavern.com domain and Blogger is managing the redirect. It may take a day or so before things return to normal... whatever that is. Move along! Nothing to see! 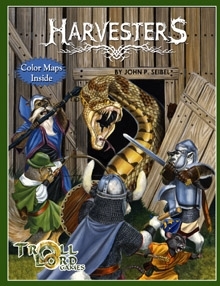 Troll Lord Games has released Harvesters, their RPG with rabbits, squirrels and other furry critters in PDF format. So, what do you get for your 13 bucks? You get a nicely written version of the Castles & Crusades rules that are aren't going to overwhelm your kids, yet should still maintain the interests of the parents. We get most of the C&C classes represented in the rules, and advancement thru level 6. If your campaign was going to go beyond that, you'd need to reach over and flip thru the Castles & Crusades Player's Handbook. 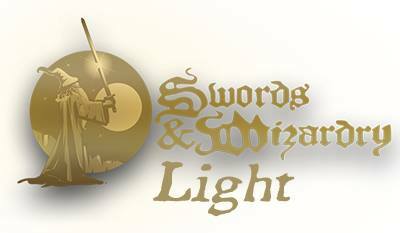 The 66 page book includes character races, classes, spells, equipment, core rules, adversaries and even an adventure and campaign world. A lot crammed into a small number of pages. Is it worth the 13 dollar price tag? 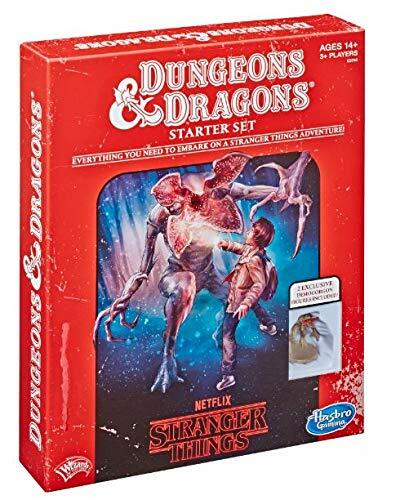 If you have young kids that are interested in Role Playing Games, this might be a very good entry vehicle, especially if the GM/DM/CK is already familiar with 3.5e or any of the clones of the older D&D games (including Harvesters' direct parent, C&C). It might even play well as a short term diversion for more adult oriented gaming groups. 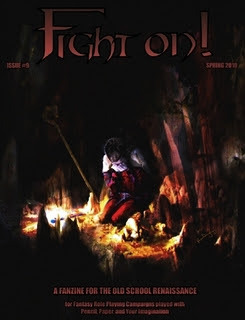 OUBLIETTE Issue 3 is Out! 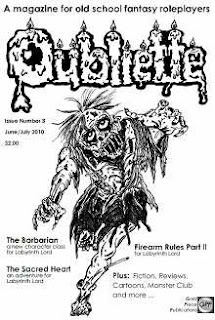 In this issue we get a Barbarian class for Labyrinth Lord, an adventure, the second part of Firearms for LL and other assorted goodies wrapped in the 47 page package. The barbarian class is chock full of abilities. I can't say how well balanced he is compared to other Labyrinth Lord classes, but he looks to be a blast to play. 2D6 +1 HD at first level makes him a nice beginner's tank. Alright, time for me to dig thru the rest. If it is anything like the first 2 issues this is an easy choice to pick up. Sunday afternoon(ish) the banner contest will be drawing to a close. Which means you have about 48 hrs left to enter. I just received Harvesters from Troll Lord Games. The quick once over looked good, now I need to conduct the full read thru. Looks like it might be a good crossover game for younger family members. 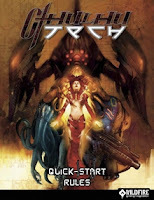 Well, not only will there be a bunch of quick starts listed here, but the first one was also a Free RPG Day Giveaway for 2010, so if you missed it last weekend you can download today. 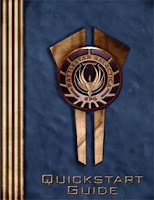 Battlestar Galactica RPG Quickstart Guide from Margaret Weis Productions. 32 page into to the Battlestar Galactica game based on the recent TV series of the same name. Sorry, my Cylons had the bouncing red eye. 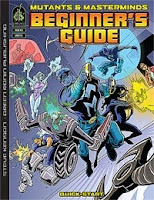 Mutants & Masterminds Beginner's Guide from Green Ronin. Green Ronin always puts out top notch products. The new DC Heroes Games is going to be based on M&M. Take a peek and see if it might be something you'll like. 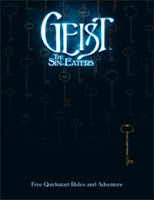 Geist: The Sin-Eaters Quickstart from White Wolf. 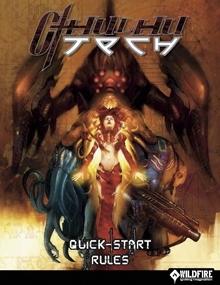 The 2009 entry into WW's World of Darkness Setting using the Storyteller System. I haven't checked out the World of Darkness setting since Monte Cook did a D20 version, but this might need to be chacked out. WotC Sacking it's Fiction Division? I read a post on ENWworld night that WotC fired the fiction line editor and apparently had nothing in the hopper for 1st quarter 2011 except for some reprint compilations. I had been under the impression that the book division was profitable, tho I will admit that I haven't read WotC published fiction in many a year. Still, it would be a shame to see the line end. I wonder if they are going to license it out to one of the other book publishers. Eh, in the end it doesn't effect me, as I no longer read it. Sentimental I guess. 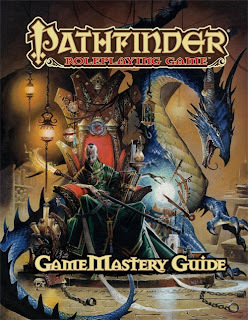 Louis Porter Jr. has a great post here about Paizo's Gamemastery Guide. Go. Read his post. I'll wait. Now, I might not be quite as affectionate as Lou, but he is spot on. 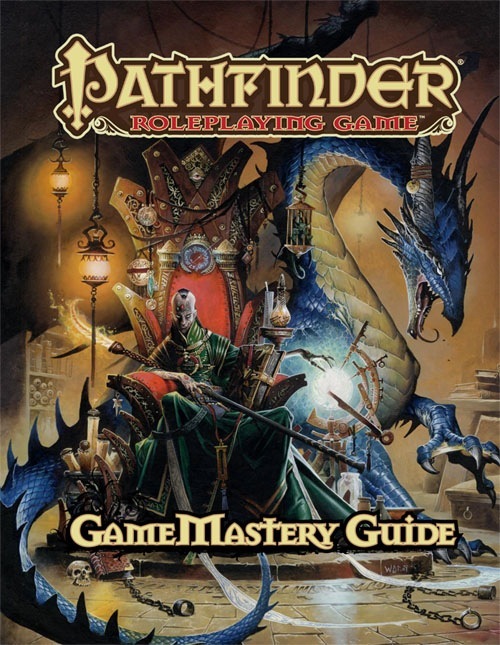 Ignore the "Pathfinder" label on this book. 80%+ is applicable to any game. It's jam packed with gaming goodness and I'm kicking myself for leaving it in the shipping box for the past few days when I could have been reading thru it. Heck, Paizo offers PDFs of its products for free if you buy the dead tree version from them. Yet another reason to high five the company. We have our first entry, and Greg has set a high bar. There are still a few days left to submit entries. After last call I'll award the prize(s). Holy Player Character Sheets Batman! I'm sure I'm not the only one with fine memories of the AD&D "goldenrod" player character sheets. Not that they fit half the crap that your character carried, especially if you had to do with a single sided photocopy. Still, they were worth their weight in gold and 10 times better then loose leaf paper. Here I sit nearly 30 years later and you can print out character sheets yourself, on your own printer, and it's probably more useful then the old "goldenrods" were. 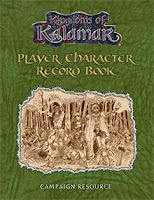 You can make your own (way beyond my ability), find ones on the net, or you can try Kenzer Co's Player Character Record Book instead. Now, just so there is no mistaking, this is a 3.0/3.5/OGL uber character sheet set. 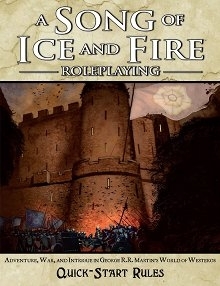 It could probably be used with Pathfinder with little to know issues, but using with some of the more OSR styled games may lead to some inconsistances, such as with saving throws. The spell sheets sheets and the NPC sheets are extremely useful. Heck, I could see myself using the NPC sheets as a DM, as I could fit 4 NPCs per sheet for easy reference. As a player, what few henchmen I had would probably have gotten a full PC sized sheet, especially seeing how we are printing these out for ourselves. My main complaint is this is still set up like a dead tree product. There is no need to repeat the same pages that are common to each class grouping. True, its not costing extra, and it is easier to print a group of pages then a bunch of separate pages, but I found it slightly annoying, probably without any good reason. 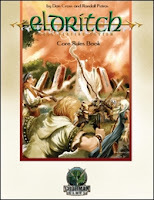 Eldritch Quick Start Rules - A Fantasy RPG from Goodman games. I bought the full rules earlier. Nice set of rules that kinda get lost in the competition. Shadowrun Third Edition Quick Start Rules - You got your fantasy in my science fiction. My last experience with this was first edition rules back in the day. 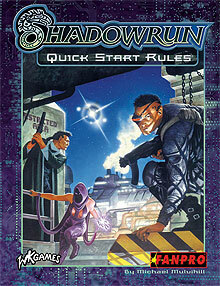 Very tempting to play in the Shadowrun World again. A Song of Ice and Fire Roleplaying Quickstart - the fantasy world detailed in George R.R. Martin’s series of novels. Go figure, a fantasy series I never read but have heard many good things about. As some / most / all of you may now know, ChicagoWiz is back, which is damn nice cause his blog was always many levels of awesome. Welcome back lad. I've also got a few reviews in the works, and of course we have the Tavern Needs a Banner Contest running. Will try and get the first batch of quick starts up tonight or tomorrow. The Greyhawk Grognard has a short piece on the new D-Infinity Magazine that is being released. Looks like it will be multiple-ruleset / multiple-genre. Something to add to my growing pile of RPG related magazines. 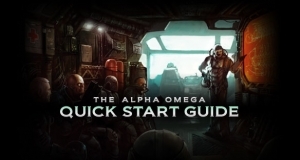 If all goes well I'll have the first installment of the quick start overview up later today. Will do more research over lunch. Yes, I need a banner I can use in forum postings. No, I have little to none in the way of artistic talent. So, I need a banner or two. That's where you, the reader, comes in. If you have any ability in banner design, it is more then I have. Heck, if you have no ability in banner design odds are it is still more then I have. 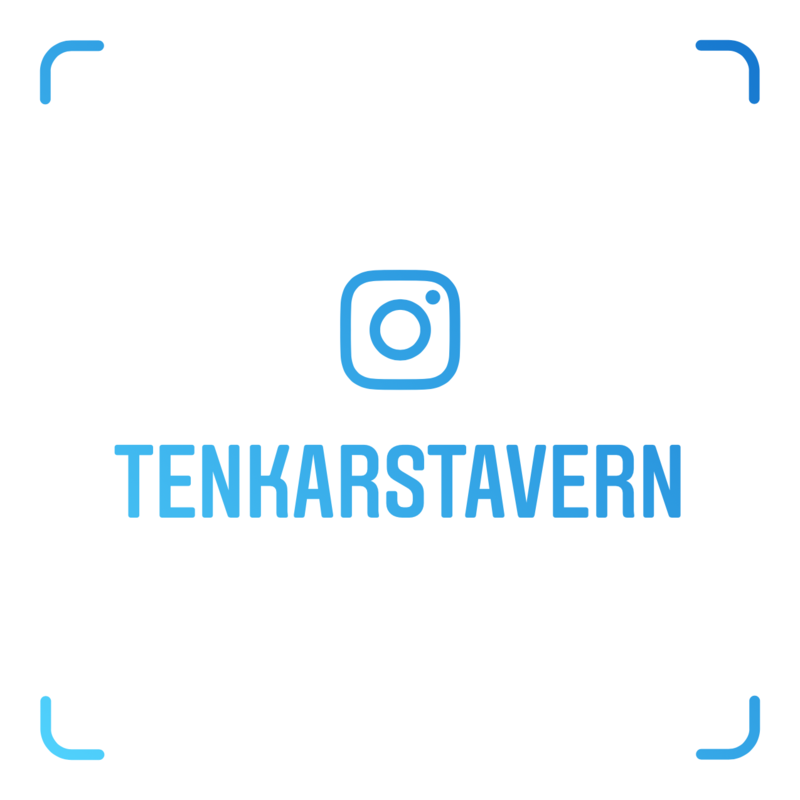 Send your entries to tenkarsDOTtavernATgmailDOTcom. 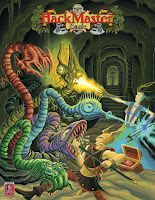 The winner will receive their choice of "Realms of Cthulhu" or "Fantasycraft" in PDF format from RPGNow (thanks again to Sean for his generosity). The crowd had already formed when Tenkar got to the scene. It took him a few moments to push his way through the throngs of onlookers to get to the partial overturned cart. "See, the Watch is here! Watcher, I never seen him! He ran right in front of the the horses. I couldn't stop them in time!" The driver of the cart appeared to be shaken and bruised, but fairly unharmed. "WHO ran in front?" Tenkar asked as he tried to look past the crowd. "Him!" The driver pointed to a man off to the side who was sitting on his legs and looking side to side in apparent confusion. Tenkar recognized him as a Blue Gill, a Sea Sapphire addict. Even if he hadn't recognized him from previous arrests, the blue tinged lips would have given him away as an addict of the strong narcotic. Being an addict wasn't in and of itself a crime, and at the moment he appeared to be the victim of an accident. Tenkar approached him with concern, more so when he noticed the bloodied pants and small pool of fresh blood that had formed under the Blue Gill. Upon noticing the Watchman, the Blue Gill tried to stand up, but he couldn't find the strength or the balance. "Lantern, I lost my boot! I can't see it anywhere! Don't let one of these thieves take my boot!" One sign of Sea Sapphire addiction was a sort of compulsive, one track mindedness. There would be no dealing with him unless the missing boot was found. "Anyone seen this man's boot?" the Watchman asked what was left of the crowd. Most folks had slowly started to walk off when the Watch arrived on the scene. Best not to be involved. "I think it's here by the cart." It was the driver who found it. "How you don't mind me not picking it up and such, but it is a bloody mess ya' know." As Tenkar walked over to the cart he saw the boot in question. It was a "bloody mess", there was no question. As he went to grab it, he noticed something white protruding from the boot, right from the end you would insert your foot into when slipping them on. Bone. Bone, flesh and blood. Gods, this man has had his foot amputated and has no idea. He turned back to look at the Blue Gill, but it was too late. He bled out as he had worried about the fate of his boot. Tenkar turned to a youth that had stuck around to watch the events. "Lad, here's a silver. Get the nearest necer and tell him he has a customer. He'll match my silver with his own." I'm not even halfway into my tour, thought Tenkar. It's gonna be a long day. Lantern - street slang for Watchman. So named for the lantern they carry on their rounds. It is lit with a continual light spell where the wick would be. Blue Gill - Sea Sapphire addict. So called because the drug slowly colors an addicts lips, teeth, and in the case of long term addicts, throat, a blue hue. Sea Sapphire - An addictive narcotic. Not a cheap drug, it's use centers more around the upper middle class and adventuring types. Game Benefits - the effects last for 4 hrs with each dose - +1 HP temporary per HD - Pain is dulled - Can fight until -10 HP without penalty, but with a loss of 1 HP per round until hitting -11, at which point the character keels over dead. CLW can stop the HP loss, but the initial casting will not heal any HPs. Casual use (1 time per adventure / 1 time per week) requires save vs poison at +4 to avoid addiction (add CON bonus to save). Using more often in the adventure / week time frame causes a save at -1 per use to avoid addiction (no +4 bonus to save). 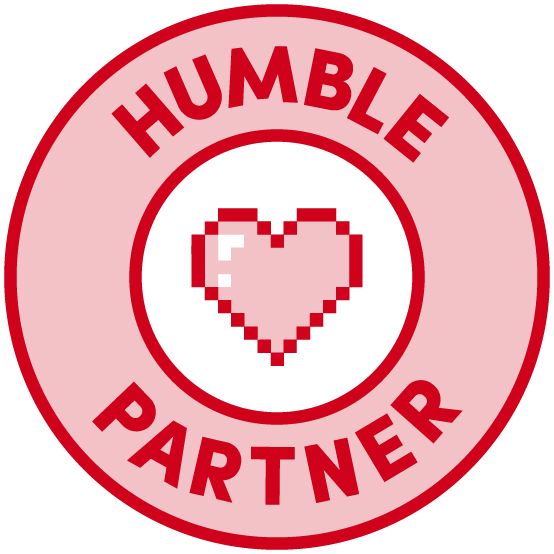 Once addicted, the drug must be used daily and no longer provides a +1 HP per HD bonus (other effects such as dulled pain and fighting until -10 are still in effect). If unable to pay for the Blue Sapphire, character in question will be unable to do anything productive (adventure, research, smithing, etc) until they either get a dose or kick the addiction. Without divine intervention the addict must go cold turkey to kick the habit. After 4 weeks without the drug a saving throw is made vs. spells. Success indicates cure, failure and addict can try again in a week. Roll of a 1, addict dies from withdrawal symptoms. Cure disease will enable the addict to make a save vs spells at +4 (CON bonus applies) to fight of the physical / mental / emotional addiction. A failed save can be tried again in a weeks time. No penalty for rolling a 1. Does not need to wait four weeks before attempting the first save.